We’d love your help. 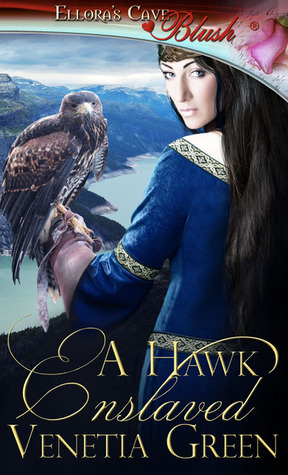 Let us know what’s wrong with this preview of A Hawk Enslaved by Venetia Green. Ragnar Ulfsson must find his king a concubine. His solution is Isolde, captured whilst climbing the sea-cliffs for falcons. Enslaved in his own way, Ragnar has few qualms about binding another to his lord for the greater good. After all, it is an honor to share the bed of a king. Isolde does not view slavery so complacently. Like a hawk caged, she is frantic to escape. But Ragnar Ulfsson must find his king a concubine. His solution is Isolde, captured whilst climbing the sea-cliffs for falcons. Enslaved in his own way, Ragnar has few qualms about binding another to his lord for the greater good. After all, it is an honor to share the bed of a king. Isolde does not view slavery so complacently. Like a hawk caged, she is frantic to escape. But the king’s hall is a bubbling stew of political intrigue and Isolde is an essential ingredient in the mix. Her only hope out is Ragnar, who captured her but also promises to free her—eventually. But there is something strange about this dark Viking, oddly withdrawn and controlled, and their growing bond will lead her into greater danger still. To ask other readers questions about A Hawk Enslaved, please sign up. Is there a reason why I cannot seem to find this book for purchase? I was able to get a sample from Amazon, and now it is no longer on Amazon for purchase nor anywhere else for that matter. I never bought a book without having read reviews first, but the synopsis was too interesting for me to pass it up. I thought it would be a beauty and the beast kind of story, but it turned out Ragnar was hot! Well, at least in my mind's eye. This book was just a little bit shy of 5 stars, for me, and that was because its predictability. The characters were interesting, the storytelling was compelling, the dialogue was great. I especially liked when the character couldn't find the right words in t I never bought a book without having read reviews first, but the synopsis was too interesting for me to pass it up. I thought it would be a beauty and the beast kind of story, but it turned out Ragnar was hot! Well, at least in my mind's eye. The characters were interesting, the storytelling was compelling, the dialogue was great. I especially liked when the character couldn't find the right words in the foreign language - it made the story more authentic. Ultimately, I judge a romance book by whether it gives me butterflies in my stomach at least once while reading it, and this one did not fail to do so - twice. Plot-wise,it was predictable (both Ragnar's issue and its resolution), and could have been less-cleanly resolved. I still enjoyed the ride, hence the 4 stars I've given it. Isolde is your not so typical hawk tamer. Raised by her father to be independent and stand up for herself she gets thrown into a completely different world when se is captured and forced into slavery as an old kings concubine. Ragnar, enslaved in his own way has mixed feelings about offering this raven haired beauty to his liege. Let’s start by saying I fell completely in love with ALL the characters straight from the start. Even the old king. Ms Green created such a fun cast of characters that d Isolde is your not so typical hawk tamer. Raised by her father to be independent and stand up for herself she gets thrown into a completely different world when se is captured and forced into slavery as an old kings concubine. Ragnar, enslaved in his own way has mixed feelings about offering this raven haired beauty to his liege. Let’s start by saying I fell completely in love with ALL the characters straight from the start. Even the old king. Ms Green created such a fun cast of characters that drew you into the story. I really enjoyed the use of language as a scene builder. It assisted in creating the feeling that I was indeed within the walls of a Viking King’s compound. I thoroughly enjoyed watching Isolde and Ragnar’s love story unfold. Her tentative explorations into a world completely unknown to her was at times funny and entertaining. My only complaint if it could be called that is that I felt the story could have ended better. I would have liked a more detailed ending to an otherwise fantastic book. There's a TV show just come out in Australia called 'Vikings' that I was looking forward to watching. About the time the TV series was being promoted, I came across Venetia Green's book, A Hawk Enslaved. When I figured out the book related to Vikings, I was hooked. Now I can say, I enjoyed this book and it kept me entertained, far more than the television show! The start was exceptional - one of the best starts to a romance I've read in forever. And I liked how the author painted such a bleak pict There's a TV show just come out in Australia called 'Vikings' that I was looking forward to watching. 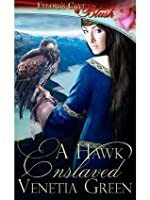 About the time the TV series was being promoted, I came across Venetia Green's book, A Hawk Enslaved. When I figured out the book related to Vikings, I was hooked. The start was exceptional - one of the best starts to a romance I've read in forever. And I liked how the author painted such a bleak picture of the weather, the people, the harshness of their lives. Everything felt extremely well researched, particularly when it came to the status and reality of the Viking culture, and the bird flying & taming. A Hawk Enslaved was a wonderful debut by Venetia Green. I thoroughly enjoyed the story of Isolde and Ragnar, a beauty and the beast tale. The intrigue and danger of the king's court adds an edge to the book and the Viking setting and customs feel realistic. This book will appeal to historical romance and fantasy readers alike. Highly recommended. I really enjoyed this. I marked lots of gorgeous sentences and descriptions. There's great tension between Isolde and Ragnar, as well as in the story itself. offering this raven haired beauty to his liege. the walls of a Viking King’s compound. This book was interesting on so many levels. The Author Venetia has a brilliant way with words. Many sentences I read over several times just because I enjoyed them so much. Isolde, the leading lady, was a feisty young woman with an unusual occupation as a Hawk tamer. Venetia took me into the work of a Hawk tamer and held me there to the very end. And the Hero Ragnar was just as compelling. Torn between his duties to his king, and his love for the kings new concubine - Isolde, it was wonderful t This book was interesting on so many levels. The Author Venetia has a brilliant way with words. Many sentences I read over several times just because I enjoyed them so much. Isolde, the leading lady, was a feisty young woman with an unusual occupation as a Hawk tamer. Venetia took me into the work of a Hawk tamer and held me there to the very end. And the Hero Ragnar was just as compelling. Torn between his duties to his king, and his love for the kings new concubine - Isolde, it was wonderful to read his character depth. Another fascinating aspect woven into the story was the interesting and often funny communication barriers between Isolde and Ragnar. The characters were really well developed and I really enjoyed the plot. I liked the heroine's mix of femininity but strength.